Hot temperatures, clear skies, high sun and no wind. It’s dock fishing time! 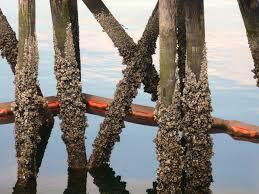 1) Age of the Dock- Older docks, tend to have more barnacles on their posts. Barnacles feed off of microorganisms and attach themselves to dock posts or anything else that is stationary in the water. Baitfish and some game fish, like sheepshead and black drum, feed off the barnacles. (I have even witnessed black drum, with their faces completely out of the water, crushing and eating barnacles off of a dock post! It was wild!) Remember, where there is bait, there are fish! As you survey the docks in the area, be mindful of older docks and take note of the amount of barnacles present. It will make a difference. 2) Size of boat at the dock- I know what you are thinking, “The Captain has had a little to much sun lately!” In all seriousness, consider the size of the boat at the dock. 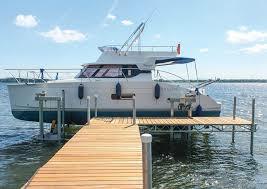 I prefer to fish a dock that houses a larger boat. Docks with large boats tend to be deeper. Deeper holes could mean the slightest drop in water temperature, and a deeper hole creates another structure for predator game fish and also gives them a sense of security while ambushing bait. 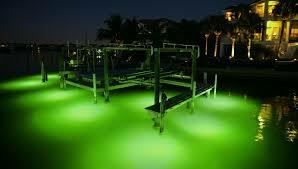 In this situation, I will skip a DOA Shrimp under the dock, let it sink and work it back extremely slow. Hold on! 3) Signs of fishing- As I examine docks and their potential to hold fish, I look for signs of fishing from the dock. 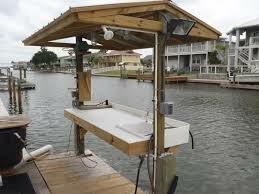 Fishing rods on the dock, a bait bucket, crab or shrimp traps, or even a well-worn fish cleaning table/station. Fishing around a dock or cleaning fish on a dock tend to attract fish, all because of the bait that is used and produced. Most anglers who clean their catch on the dock’s cleaning station throw the fish carcasses into the water, which feeds bait fish, which in turn brings in the game fish. In closing I would like to add, that while you are out fishing docks and examining these three characteristics, also keep and eye out for lights, both submerged and above the water line. Lights at night over or in the water will draw in bait fish and as mentioned earlier, where there is bait, there are fish!